A simple feel-good tune backed by guitars, keys and the subtle hints of sarangi – Sun Le Re has a very likeable mix in its arrangement. And the icing on the cake is Papon’s soulful rendition. After getting used to the ease pace of the song, the faster and more rock-flavored Reprise version (which is again sung by Papon) doesn’t sound as appealing. Papon gets a third song too in the soundtrack. Khud Se also follows a breezy piano-guitar template, only instead of the sarangi it is the occasional snatches of Carnatic violin here (played by Finix Ramdas). And once again Papon pulls off a fabulous job. Shantanu Moitra gives the best of the soundtrack to Bollywood debutant Zebunnisa Bangash (of THE Zeb and Haniya!). Ajnabi has a thoroughly endearing tune that makes use of Zeb’s voice beautifully, while complementing her with a minimal unplugged background. The second half of the soundtrack is composed of theme pieces which are mostly functional and should work better in the movie. Conspiracy has Monali Thakur doing a short cameo with the humming bits in an otherwise instrumental piece with an Arabic flavor. The melancholic violin piece called Entry To Jaffna is too short to be impactful. It is the two title themes that are truly engaging among the four. Theme 1 has Moitra introducing one stringed instrument after another, gradually building pace to a rousing crescendo where the percussion too is thrown in for added effect. Theme 2 also plays around the hook from Theme 1 in its first half (that sees some beautiful harp and violin) before changing mode to end on a more sinister note. 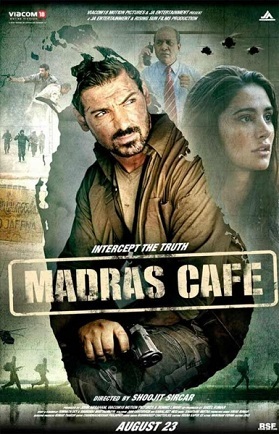 Madras Café. Shantanu Moitra-Shoojit Sircar team scores once again! Congratulations Vipin! Your blog won an award at IBAwards 2013!